1. to check constantly on a given condition or phenomenon, e.g., blood pressure or heart or respiration rate. 2. an apparatus by which such conditions or phenomena can be constantly observed and recorded. ambulatory ECG monitor a portable continuous electrocardiograph recorder, typically monitoring two channels for 24 hours; it is used to detect the frequency and duration of cardiac rhythm disturbances and to assess pacemaker programming. The term is sometimes used synonymously with Holter monitor. apnea monitor a device with alarms, used to detect cessation of breathing, most commonly used in neonates and infants who have demonstrated apnea or who may be at risk for developing apnea. These monitors can be used in the hospital or in the patient's home. Holter monitor a type of ambulatory ECG monitor. A device that displays and/or records specified data for a given series of events, operations, or circumstances. 1. to check constantly on a given condition or phenomenon, e.g., blood pressure or heart or respiratory rate. 2. an apparatus by which such conditions can be constantly observed or recorded. ambulatory ECG monitor , Holter monitor a portable continuous electrocardiographic recorder used to detect the frequency and duration of rhythm disturbances. 1 v, to observe and evaluate a function of the body closely and constantly. 2 n, a mechanical device that provides a visual or audible signal or a graphic record of a particular function, such as a cardiac monitor or a fetal monitor. A person employed by a drug sponsor or clinical research organisation (CRO) who is responsible for ensuring that a trial is being conducted in accordance with the protocol and good clinical practice (GCP) guidances. Monitors work with the clinical research co-ordinator to check all data and documentation from the trial. Helping plan and initiate a trial; assessing the conduct of trials; assisting in data analysis, interpretation and extrapolation. The independent (non-departmental public body or quango) regulator of NHS Foundation Trusts. Once a trust has been authorised (granted Foundation status), Monitor monitors its activities to ensure ongoing compliance with the terms under which the trust was granted Foundation status. The Care Quality Commission (CQC) benchmarks a trust against healthcare standards, and sends Monitor copies of its inspection reports. Monitor may intervene in Foundation trust operations if it fails to meet healthcare standards, or if there is an "Omega Threat" incident, or if some aspect of its activities results in a significant breach in the terms of its authorisation. Clinical medicine A device which assesses the status of a particular parameter. See Apnea monitor, Holter monitor Managed care Any parameter regularly and consistently used to evaluate quality of care Lab medicineA component of an instrument that detects physical or chemical fluctuations in electromagnetic radiation. 1. A device that displays or records specified data for a given series of events, operations, or circumstances. 2. To assess a function of the body on a close constant basis. 1. One who observes a condition, procedure, or apparatus, esp. one responsible for detecting and preventing malfunction. 2. A device that provides a warning signal when another device fails or malfunctions or when a measurement threshold is reached. 3. To check by using an electronic device. A device that automatically obtains and usually records the blood pressure at certain intervals, using the direct or indirect method of determining pressure. In some models, an alarm or light signal is activated if the pressure rises or falls to an abnormal level. A visual and/or audible recording of each electrical impulse or physical contraction of the heart. 1. A monitor that detects and displays fetal heartbeat. 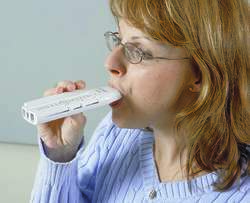 A device used to detect variations in respiratory rate and volume. It measures changes in the electrical impedance of the chest as the patient breathes. It may be used in intensive care units to monitor critically ill patients or in private residences to detect apnea, esp. in sleeping infants. A handheld device used to assess the maximum expiratory flow (in liters/minute) in patients with asthma and chronic obstructive lung disease. A small device worn or carried by a person to measure the accumulated radiation dosage over a period of time. A monitor for measuring and recording temperature of the body or some particular portion of the body. In radiation therapy, a calibrated unit of dose that determines the length of the treatment. An electronic sensor applied to or worn around the abdomen to note and record uterine contractions and fetal heart tones. Such sensors are sometimes used by patients at home, particularly if they have a history of preterm delivery. If home monitoring is used, patients are taught to apply the monitor daily and transmit the data by telephone to a health care professional for analysis. After analyzing the data, a telephone assessment for symptoms and signs of preterm labor is conducted, with necessary advice given to the patient. A heat-sensitive indicator on the outside of a vaccine bottle that changes color when the vaccine has been exposed to excessively high temperatures, making it unsafe for patient use. 1. A device that displays and/or records specified data for a given series of events, operations, or circumstances. 2. To observe over time. n to observe and evaluate a function of the body closely and constantly over time for diagnostic purposes. 1. continuous observation and measurement of a variable; to check constantly on a given condition or phenomenon, e.g. blood pressure or heart or respiration rate. 2. very large lizard, up to 10 feet long. Aquatic or terrestrial, carnivorous and carrion-eating. Members of the family Varanidae, e.g. Varanus griseus, the desert monitor. devices used to monitor an anesthetized patient to alert the anesthetist and surgeon of abnormalities in the heart rate, respiration and blood pressure. Most are electrical and rely on a satisfactory connection to the patient. developing work plans and starting monitorships of their own. lessons of monitorships, however, it seems unlikely to occur on its own.